The following article is based on the principles and techniques taught in the Knife Defense videos. 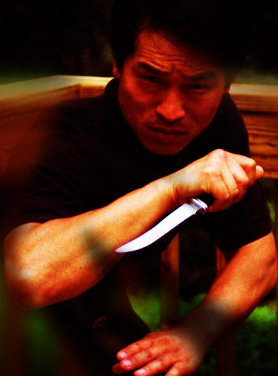 It is intended to give a brief overview of the central tenet of knife combat for the experienced martial artist. This article is for educational purposes only. In the midst of chaotic situations where knives, clubs, metal pipes, rocks flying around, our unit members who tried to run away from the attackers got seriously injured. Those who chose to stay closer and fight, by following T. Kim’s instruction, survived.